All Things Lesbian: LAST CHANCE TO ENTER: WIN Tickets To THE DINAH SHORE WEEKEND!!! LAST CHANCE TO ENTER: WIN Tickets To THE DINAH SHORE WEEKEND!!! Want to win 2 tickets for you and a friend to the Dinah Shore Weekend? 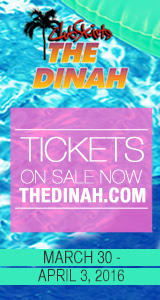 All Things Lesbian is working with BlogNation and the Dinah to give away 2 tickets for spring break. And guess what... Entry is FREE! If you win two tickets to the Dinah, what would be your best pick up line? Of course, there are no wrong answers, but just remember we are looking for two things: originality and humour. I mentioned that it's free to enter, right!? Email us now! (Competition closes February 29th, 2016).